Become a martial arts master in this old school Data East classic. Long before the Street Fighters and Tekkens appeared, Data East's Karate Champ was king of the brawlers. This 1984 arcade classic stood out for its twin stick control scheme and ridiculously cheesy (in a good way) Japanese design. Unfortunately, we haven't had an opportunity to play it in ages, save for MAME emulation. Luckily, Revolutionary Concepts graced us with a high-quality port for the iPhone, iPod Touch and iPad at a very reasonable price. In the game, you play a karate student taking part in a number of bouts, usually against an opponent wearing a red gi. Your goal is to take him down with a key hit, be it in the head, leg or other vulnerable spot on the body. You won't find over-the-top combos or fancy throws, only real karate techniques. Like the 1984 arcade game, you play with two virtual joysticks, one handling your fighter's movement and the other for his attacks. There's a whole spreadsheet of moves to master, some which come off better than others. You're more likely to get the hang of the front leg sweep than the jumping kick, although you'll feel more satisfaction executing the complicated ones. The only downside is that you'll need to practice with the dual sticks, as they work differently than holding real ones. Fortunately, the Practice Mode lets you do that. In addition, Karate Champ contains a solo player mode with 12 various matches and backdrops, along with the option to fight against a friend in two-player. You can hook up via Bluetooth or Wi-Fi, and both ways work well. 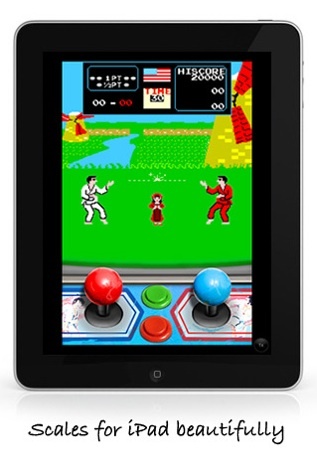 Revolutionary Concepts, the same developer that delivered the remarkable Cobra Command to the iPhone, does fine work replicating the old arcade game. The visuals are intact, from the giddy smiling face of your student as a girl approaches to the angry bull that charges at you in later bonus rounds. We also like the audio, complete with karate shouts ("Hyah!") and judge announcements. ("Half point.") There's only one song in the game, but it's fun to listen to. Perhaps the best part about all this is the price. You can relive this piece of arcade history for a mere two dollars, or eight quarters in old-school arcade terms. It's definitely worth the investment, especially if you're curious to see where fighting games got their start. Even though it's not as fast paced as other fighting games, we heartily recommend Karate Champ. It's fun to play (even though you'll need a few rounds to get used to it), and a great reminder of how great retro games used to be, and in some respects, still are. Now if only Revolutionary would work on Bad Dudes, we'd be set. 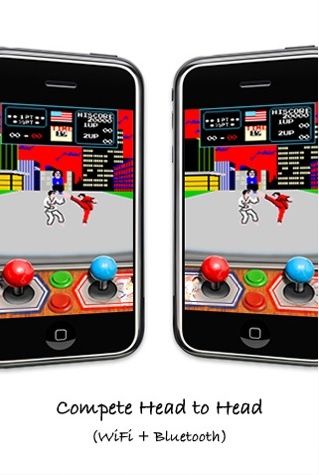 What's Hot: Perfectly emulated graphics and sound from the arcade game, engaging bonus rounds, two-player bouts via Wi-Fi and Bluetooth, practice mode lets you master the tricks of the trade, only two bucks. What's Not: Dual stick controls will take some getting used to, some moves take a while to master.